The Spring Escheatment Cycle is Already Underway. Escheat reporting truly is a year-round process, and for companies with upcoming reporting obligations, preparations for Spring deadlines start right after the Fall season concludes.  We invite you to get a head start on the 2019 escheat cycle with our new unclaimed property reporting and compliance webinar. This 60-minute webinar will focus on what your company can and should already be doing in advance of the upcoming spring deadlines, how to stay ahead of escheat related tasks, and how to ensure compliance with state unclaimed property laws and regulations. This session will be led by Laurie Andrews of Keane’s Unclaimed Property Consulting & Advisory Services Division and Director of Marketing, Joe Lichty.